Hey guys! 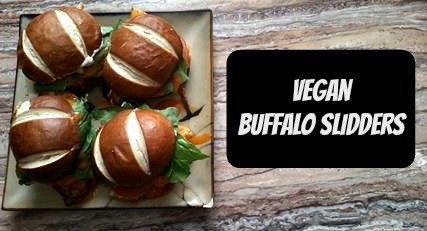 Today I am going to share with you a delicious vegan alternative to a Chicken Buffalo Sandwich. My husband absolutely loves buffalo anything, the for him the best of the best is a Chicken Buffalo Sandwich. This is one of the things he has missed the most since we have transitioned to a plant-based diet. We really try to stay away from the frozen vegan food, or as I like to cal it "Vegan Junk Food" as much as possible. I find that it makes me feel heavy and bloated. So, I used cauliflower instead of a processed alternative. 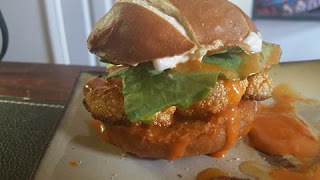 If you want to make this as a regular sized sandwich rather than sliders, you can simply slice a head of cauliflower into 1/4-1/2 inch slices, for sliders, it is a bit more complicated. You will actually need to cut up a bit more to fit into the size of the bun you are using. Now, because we are working with cauliflower if we cut it the wrong way it will all fall apart! 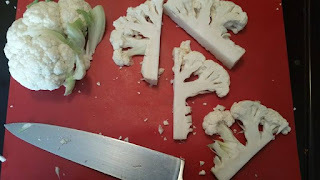 My solution to this is to cut it into triangles or in half depending on the size of your cauliflower, photo example below. Then I roasted them this way. If you would like, you can pan fry them, but I was looking to cut out extra fat where ever I could. While the cauliflower is roasting, the next step is the buffalo sauce. Traditional buffalo sauce does have butter in it, so this will not work for us. You can pick up a vegan buffalo sauce at Trader Joes or you could just make it! I will include a recipe for it below. I love making things from scratch, I feel that it is the best way to know what is really going into your food. However, I also get that sometimes we just don't have time to do all of that extra stuff and just need to buy it. Whichever way you decide to go it will still be delicious! 6. Put the sandwich together. I recommend doing it in this order from the bottom. Cauliflower, tomato, lettuce and top with any extra sauce. These look absolutely delish! 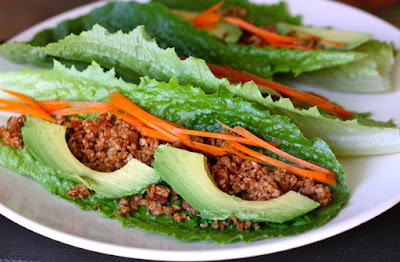 I like the idea of roasting them too to cut down on fat - no "vegan junk food" going on here :) It can be so easy to keep frozen burgers and things in as a back-up option when you're busy but it's something I'm trying to cut down on myself. What a delicious recipe and such good use of cauliflower.I need to try this soon.